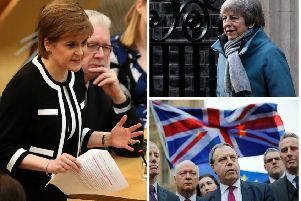 Comment: Brexit - what will happen next in Scotland? What happens next now that UK has voted to leave the EU? Legal experts Charles Livingstone and Christine O’Neill explore what could happen next, after the UK voted to leave the EU. The UK has voted to leave the EU. A majority of Scottish voters voted to remain, adding an extra layer of constitutional complexity to an already complicated issue. Arguments had been made prior to the referendum that this disparity between the Scottish vote and that in the UK as a whole could be a basis for a second Scottish independence referendum, and those were immediately echoed when the result was confirmed. The process for ‘Brexit’ and the question of a further referendum both raise complex, and closely intertwined, legal issues. The question of whether the Scottish Parliament can unilaterally legislate to hold an independence referendum (i.e. without Westminster consent) was one of the earliest battles of the original referendum. The majority of legal opinion was that it could not, as the Scotland Act 1998 reserves the Union of Scotland and England to the UK Parliament, but enough commentators took the opposing view to let the Scottish Government argue that it could. The issue was resolved when the UK Government agreed (in the ‘Edinburgh Agreement’) to confer the power to hold a referendum. However, that was limited to one referendum by the end of 2014, and so could not be relied upon again. The Edinburgh Agreement was carefully worded to leave open the question of whether UK consent was legally necessary, but having gone down that route once it may be harder (though not impossible) for the Scottish Government to argue that it is not. There would therefore be at least a risk of legal challenge to any unilateral Scottish Parliament legislation seeking to authorise a second referendum. Whether the UK Government would maintain its position that it will not consent to another referendum is a political question. However, the complexities and uncertainties of the Brexit process could at least make a ‘snap’ referendum difficult, as there could be real uncertainty about what a vote either way might mean. The decision to leave the EU will now need to be followed up with detailed negotiations about how and on what terms Brexit should happen. Article 50 of the Treaty on European Union allows a Member State to give notice of its intention to leave. When the UK does that it will kick-start a two-year period in which to negotiate the terms of exit and the shape of the future UK-EU relationship. The deal will require the consent of the European Parliament and a qualified majority of the other Member States. If no agreement is reached within that period, the UK would leave the EU at that point regardless unless all the other Member States agreed to extend the deadline. Notice does not have to be given immediately, however, and in his resignation statement the Prime Minister said the timing should be up to his successor. As the negotiations will likely need years rather than months, some ‘pre-notice negotiations’ may help manage the time pressure. The future UK-EU trading relationship will likely be top of the agenda, and businesses will want that resolved as soon as possible. This is where the relationship with a further independence referendum becomes complicated. Without clarity on that future UK-EU relationship, it could be hard to know what a vote for independence (or indeed to stay in the UK) would actually mean. Many Scots may have voted Remain because they wanted free access to EU markets. Some of those voters may favour independence if that is the only way to maintain that, yet be content to remain part of the UK if some other trade arrangement can be worked out with the EU. There would also be a need to re-open one of the dominant questions of the 2014 debate – whether an independent Scotland could in fact transition to EU membership in its own right, and on what terms. It seems unlikely that this could form part of the exit negotiations unless Scotland had already voted for independence in a second referendum, creating a chicken-and-egg problem. The independence ‘prospectus’ from the 2014 referendum may also have to be revisited, as the EU may frown upon a Member State sharing currency and regulatory arrangements with a non-Member State. In addition, because the EU is a customs union, the Scotland-England border could only remain open if a UK-EU free trade agreement permitted it (also a significant issue for Ireland’s land border). Clarity on the post-Brexit UK-EU relationship would therefore be important to properly understanding any independence proposal. With apologies to Churchill, the ‘Leave’ vote may not be the end, nor even the beginning of the end, but just the end of the beginning of another difficult constitutional conversation. Charles Livingstone and Christine O’Neill are Partners in the public law & regulatory team at Brodies LLP.